As anyone who has gone through the process can tell you, choosing the right doctor to perform your liposuction can be both time-consuming and frustrating. Because even after you’ve narrowed down the list of surgeons to those properly qualified, it then comes down to choosing the right one for you; the one who shares your vision. Although many doctors are willing to perform liposuction — and may even advertise themselves as “cosmetic” surgeons — only board-certified plastic surgeons are trained specifically in this area of expertise. And since liposuction is typically (but not always) performed in the doctor’s office on an out-patient basis, it’s easy to assume that a given doctor is qualified to perform the specific procedure you’ve chosen. However, choosing a doctor who is not verifiably board-certified is undoubtedly a step in the wrong direction. Making the decision even more of a challenge is that in the US the term “board certified” can be a very confusing matter. Since most surgeons promote themselves according to their various certifications and medical society memberships, their actual knowledge and experience can be quite misleading. Although all medical boards require a certain level of surgical training and proven competence, these requirements vary greatly from board to board, and as a result, not all board-certified physicians are trained equally across the full range of cosmetic procedures currently offered–including liposuction. In the US, there are three primary boards relevant to plastic surgery: the American Board of Plastic Surgery (ABPS), the American Board of Facial Plastic and Reconstructive Surgery (ABFPRS), and the American Board of Otolaryngology (ABO). While the ABFPRS certifies surgeons for facial and reconstructive surgery, and the ABO certifies in ear, nose, head, neck and throat procedures, it is the ABPS that demands the most complete surgical training regarding the entire body–including breasts, thighs, stomach, back, and buttocks reduction. That’s why it’s always advisable to check a doctor’s qualifications by calling the American Board of Medical Specialties (ABMS) or visiting their website even before scheduling the first interview. Once you have your list of qualified liposuction doctors narrowed-down, it’s time to start interviewing. But before making that first meeting, be certain your personal goals are set firmly in your mind (and make sure they’re reasonable). Going without a clear picture of what you want to accomplish will greatly increase your chances of being persuaded by a doctor’s own sense of aesthetics, with you ultimately ending up with a look you’ll find unflattering–and disappointing. 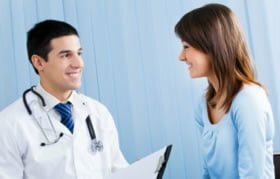 It’s also important to realize that it may ultimately require several meetings with several doctors before you find the right one who understands what you want to accomplish and can commit to your vision. And while many liposuction candidates fail to consider proximity of their doctor, it’s wise to choose one as close as possible–just in case. Keep in mind: You are in charge. Every decision — from choice of doctor to choice of procedure — is yours to make. And you should never settle on a particular doctor until all your questions have been answered and all your concerns addressed.